In Defence of Edward Evans - Accused of Sabotaging Scott's Polar Party. Scott himself has come under fire for perceived fault, the accusations ranging from bad planning, and his choice of ponies as a mode of transport as opposed to dogs, to his placement of One Ton Depot and his selection and demotion of the various members of the supporting teams, on the southern journey. All can be validly argued, and indeed counter argued, in most instances. Albeit that is, the placement of One Ton Depot, 30 miles shy of it’s intended standing, which did of course have massive repercussions, on the homeward journey. Lawrence Oates walked to his death, in the latitude where it should have stood, and Scott, Wilson and Bowers, all died, 11 miles shy of it’s more northerly footing. But was this the paramount contributory factor in their deaths? Almost certainly not! Had they reached the depot at its intended destination, Oates was beyond any redemption, other than immediate medical attention, and prompt extraction, neither of which would have been possible. Despite a relative abundance of rations and fuel at their disposal, it is almost certain that the other three men would not have survived either, without the intervention of a rescue party. Apsley Cherry-Garrard and Demitri Gerov could have been that rescue party. They arrived at One Ton on March 3rd 1912, to add extra XS Rations to the depot and waited there until March 10th, hoping the polar party would arrive. Acting under orders given to them by Dr. Edward Atkinson, they did not venture beyond the cache, as it was made clear that the dogs were not to be risked, as they were integral to sledging expeditions planned for the following season. Atkinson was taking instruction from orders left by Scott before his departure; orders which Scott apparently changed, during the southern journey, sending back a new brief with Lt. Edward Evans, who returned as the last supporting team with Tom Crean and Bill Lashly. This order, that the dog team was to proceed as far south as the Beardmore Glacier, to meet the returning pole party, was never acted upon, and will be examined later in this post. But even if Cherry-Garrard and Gerov had travelled to One Ton Depot, had it stood in it’s intended destination of 80º S, and allowing an extra 3 or 4 days sledging time, to cover the extra 30 miles, could they have saved their comrades? Again, alas, almost certainly not! If we assume Cherry-Garrard would have acted as he did in the actual instance, he would have arrived at the point on the 6th or 7th of March, stayed for seven days, which equates to them leaving on the 13th or 14th of March. Scott’s team would not have trundled in, until the 17th March. Cherry-Garrard was the first scapegoat in the task to assign human fault to the tragedy. 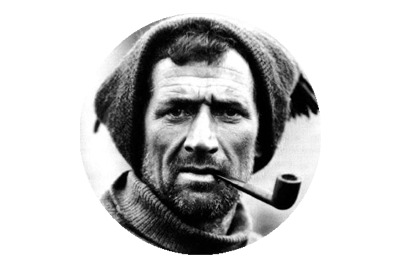 His book The Worst Journey In The World, is an epic and comprehensive account of the entire expedition, sadly tinged by an undercurrent of his efforts to disassociate himself from the accusations of abandoning Scott. He was not to blame, but carried the burden for the remainder of his days. There are countless other theories as to why the men died, and who was to blame in each and all scenarios. The latest conjecture to come to attention, is an article by Chris S. M. Turney. It is a dissertation of the role played by the above mentioned Edwards Evans, in the Terra Nova Expedition, which reaches the conclusion, that Evans through his actions, was complicit in the deaths of Scott and his men. As earlier stated the expedition is rife with plot and subplot, so the exploration of another possible aspect to the events that unfolded from 1910-13, is always welcome and intriguing. What I do take umbrage to, is the authors claim to have proof, that Edward Evans deliberately consumed more than his allotted share of rations, at the depots, subsequently leaving Scott’s team short of food, and they all starved to death as a result. If that is not enough to convince you of Evans’ guilt, Chris Turney also claims to have proof that Evans deliberately withheld Scott’s revised orders regarding the dog team, thus consigning the starving men to die in the helpless limbo of Antarctica, awaiting the help that would never come. Such is the villainous portrayal of Evans, it is suggested he had a backup plan, should the death by starvation plot fail. These are, without doubt the most serious of accusations, and ones that most definitely require clear and conclusive proof. But is it provided? But firstly, lets immediately and thoroughly absolve Edward Evans from any role, blame or part played in the death of Edgar Evans. Edgar was the first of the polar party to die, and it has been widely accepted, that his demise was set in motion by a number of falls endured; the most serious of which occurred on February 4th, 1912, when both he and Scott plunged through a crevasse. As a result of the serious concussion he suffered in this accident, his condition gradually deteriorated, and he died near the foot of the Beardmore Glacier, on February 14th, shortly after a bout of delirium. Evans had also concealed from Scott, a very bad cut to his hand, suffered when working on sledge runners, during the outward march. The actions, or lack thereof, of Edward Evans can in no way be associated to this tragic death. Henceforth the number of deaths that can been linked to the actions of Evans, in the article is four. Namely Robert Falcon Scott, Dr. Edward Wilson, Henry Bowers and Lawrence Oates. It is good that you should have time to read quietly, and think over all that has come to you from him – it will enable you to decide what to do and be prepared for what the future may have in store. . . I cannot but think that more has happened than has been mentioned and that the diaries and journals that were sealed, contained things which had been done or said which it was not for those into whose hands the diaries had first fallen to reveal – I may be wrong – I hope most sincerely that I am, but I cannot put away the sense of fear which comes from knowing so much of the expedition and its members. . . I dread the gradual coming out of the painful revelations when the whole of the Expedition’s people have dispersed to their homes. . . God grant that there may be nothing that will give you pain or add to your burden! L. Beaumont (1913a). Letter to Kathleen Scott, 15 March 1913 (MS 2;D). Cambridge: Scott Polar Research Institute. Curzon it appears made notes at his meeting with Kathleen Scott, where he recorded his belief that Oates took opium, before walking to his death on March 17th. Also noted was the “big surprise” to emerge from Scott’s diary, that concerned ‘the exhaustion of food & fuel at the depots, on the return march. It appears that the revelation implied that the returning party, under Evans’ command had consumed more than their share at one of the depots, and this prompted Curzon to push for an enquiry. But it seems Beaumont was rather against such a prospect, and in letters, at least one of which was marked ‘Confidential’, he expressed the following concerns to Curzon. L. Beaumont (1913b). Letter to Lord Curzon, 17 April 1913 (Mss.Eur.F112/51). London: British Library. L. Beaumont (1913d). Letter to Lord Curzon, 19 April 1913 (Mss.Eur.F112/51). London: British Library. To bolster his arguement Curzon then met with Oriana Wilson, widow of Edward Wilson, and she divulged to him, her findings on having read her husbands diary. Mrs Wilson told me later there was a passage in her husband’s diary which spoke of the ‘inexplicable’ shortage of fuel & pemmican on the return journey, relating to depots which had not been touched by Meares and which could only refer to an unauthorised subtraction by one or other of the returning parties. This passage however she proposes to show to no one and to keep secret. G. N. Curzon (1913c). Notes, 16 April 1913 (BL MSS EUR/F112/51). London: British Library. As it transpired, the enquiry never did take place, and the author offers the reason that it did not, was perhaps made on sympathetic grounds. Shortly after Evans had returned home, his wife Hilda had fallen ill. Within days she was critically ill, and soon died. The cause of death was peritonitis, and it was deemed that Evans had enough to cope with, without the added pressure of an inquiry into his actions on the British Antarctic Expedition. The battle for the establishment of that enquiry is portrayed as one between two men – Curzon and Beaumont, whereas in actual fact the committee of Fellows of the Royal Geographical Society voted on the matter. Beaumont actually wrote to Curzon to thank the committee for their unanimous verdict, which was in favour of not holding the enquiry. Is it really plausible to assume that the decision was taken because Evans was grieving, when the matter at hand concerned the deaths of five men, and the conclusion was to be revealed to five grieving families? It is surely more conceivable that the decree indicated a lack of evidence, and or no case to be answered. The accusation is made, it seems, on the stated assumption that it was the last support team, who had over-indulged, citing Evans in particular as he was suffering from scurvy, and would have sought more food as a means of fighting the ailment. But this could only have been speculation, as there is no way of knowing who, if any, of the returning men had taken more than their share. Many comparisons are made in the article, pertaining to William Lashly’s diary, and the timeline of entries recording when Evans first showed signs of scurvy, and his subsequent decline. The author claims that the original diary is offset by a week, when compared to the version published in Cherry-Gerrard’s Worst Journey In The World. The reason for the altered narrative, he claims was that; with the input of Evans, William Lashly changed the entries to portray Evans as having been suffering from scurvy, a week earlier than he actually was. Why? Because, Evans had taken the food, before he was struck down, and did so out of complete bitterness at having not being selected to go to the pole! So the allegation against Evans is not that he over nourished out of necessity, but that he purposely plundered the food, to deliberately sabotage the survival chances of the five men who had gone to the pole. An incredulous indictment. Aside from one depot on the polar plateau, and the Upper Glacier Depot, near the summit of the Beardmore, the remaining eight main caches (up to and including Corner Camp) were accessed by returning teams, prior to the last support party, led by Evans. The two dog teams led by Meares and Dimitri, had travelled much further than planned, on the outward journey, such was the performance of the dogs. They turned for home at the base of the Beardmore Glacier on December 11, 1911. They would have accessed six depots, up to and including corner camp. The First Supporting Party which consisted of Atkinson, Cherry-Garrard, Wright, and Keohane, turned back in latitude 85º 15′ on December 22, 1911, and would have accessed eight depots, once reaching the same point. The Last Supporting Party, which consisted of Evans, Crean and Lashly, turned for home in latitude 87º 32′ on January 4, 1912. 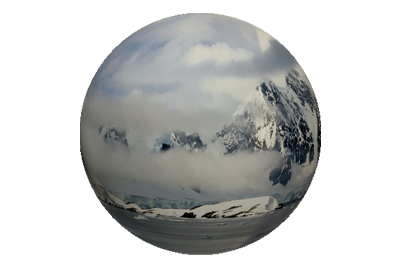 The first food cache they would have accessed was the 3 Degree Depot, on the polar plateau, and the next was situated where the summit of the Beardmore meets the plateau. This was the Upper Glacier Depot, and was the point where the First Supporting Party had returned to base. This is one of the two depots where Scott estimated their allocation depleted. Nowhere however, in this entry in Scott’s diary, does he speculate that Evans was the one responsible for the shortfall in their allowance. The article however suggests it as an instance that justifies just such a charge against him. Part of the argument is that Evans was so bitterly disappointed not to have been selected for the Polar Party, that he took the food as a gesture of callous revenge. Evans was indeed disgruntled by the perceived snub, and the fact that Scott had added an extra member to the his own party, leaving Evans with only Crean and Lashly, for their 750 mile return journey; instead of the conventional four man units that had always comprised a sledging team. . . .Capt. Scott took one of my people, Bowers, to make his hauling easier – thus having 5 men to do what I was expected to accomplish with 3. When we parted I was as fit as anyone, and scurvy only developed when 300 miles from our base. . .However his [Scott’s] injustice has brought retribution. He has failed in the primary object of his expedition. I return to bring back the party because I started the show and will not be like a rat leaving a sinking ship. E. R. G. R. Evans (1912). Letter to Captain J. P. Irven, 5 July 1912 (MLDOC 1468). Sydney: Mitchell Library. Retrieved from: http://archival.sl.nsw.gov.au/Details/archive/110359048. Earlier in the article, the author presented a number of quotations from other expedition members, that speak unfavourably of Evans. There is nothing unusual in the misgivings of one man towards another in the journals of Antarctic explorers. These men lived and laboured in restrictively close confinement, on the harshest, most hostile continent on earth. The grating of personalities, in such a setting was surely inevitable, and the men’s opinions of each other seemed to fluctuate greatly. For example, Lawrence Oates penned many reservations about Scott and his ability to lead the assault on the South Pole, that though born of sheer frustration, can easily be deciphered as resentful and embittered. Yet the general consensus is that in the end, Oates actually sacrificed himself, to afford Scott, Wilson and Bowers a chance of survival. Deeming his afflicted presence detrimental to their endeavours, he walked to his death in a raging blizzard, on March 17th, 1912. The disparaging quotes about Evans, appear for no other reason but to portray him as an unpopular and unsavoury character; one capable of such treacherous acts, as those suggested. C. Bull & P. F. Wright (1993). Silas: the Antarctic diaries and memoir of Charles S. Wright. Columbus, OH: Ohio State University Press. Scott had not decided who would be in the final sledging team to attempt to reach the Pole. As the journey had progressed, he had taken the licence to carefully monitor the performance and fitness of the men, and subsequently made his selections based on these observations. When it was announced to him on December 20th, at the Upper Glacier Depot, that he would be in the returning team, it seems Wright was furious; deeming that he was more worthy of proceeding south, than Edward (Teddy) Evans. But the quote from Wright emphasises more animosity towards Scott, than it does to Evans. You sense he felt betrayed, finding it incredulous that Evans would continue on, whilst he had to return. The malevolence towards Scott is certainly blatant, as he labels him a fool. Could it be argued that Wright removed the day’s allowance of biscuit, because he was so upset by Scott’s decision. “Too wild to write more,” suggests he was greatly affected by the arrangement. I am not for a moment suggesting that this was the case, but it is no more a ludicrous imputation, than that which is levelled at Evans. I make the point simply to portray how speculative and baseless notions can be formulated from pure conjecture. One more person, who is identified as being very upset over the shortage of biscuit at the cache was Henry Bowers. ‘Birdie’ as he was affectionately, and somewhat insensitively known, was the expedition quartermaster and had carefully estimated, packed and dispensed the ration allowances for the entire journey. It was a role that by all accounts he was quite adept at fulfilling, and his expertise and diligence is well noted in the journals of his companions. It can also be proffered that Bowers was extremely annoyed at himself, having perhaps made a miscalculation when the depot was laid. No more fanciful a notion than suggesting Evans deliberately and maliciously took the food. In fact I find it much easier to accept that the shortage could have been a result of a simple human error, as opposed to human enmity. “This morning when we depôted all our gear I changed my socks and got my foot badly frostbitten, and the only way was to fetch it round. So although Mr. Evans was so bad he proposed to stuff it on his stomach to try and get it right again. I did not like to risk such a thing as he is certainly very weak, but we tried it, and it succeeded in bringing it round, thanks to his thoughtfulness, and I shall never forget the kindness bestowed on me at a critical time in our travels, but I think we could go to any length of trouble to assist one another; in such time and such a place we must trust in a higher power to pull us through. From the Diary of William Lashly quoted in “The Worst Journey in the World: Antarctic 1910-1913” referencing Evans’ act to warm the frostbitten foot of William Lashly, despite himself being incapacitated and strapped to the sledge. The second depot where Scott found supplies to be short was was the Mount Hooper Depot, which the four men arrived at on March 9th, with Oates in particular, suffering badly from frostbite. There is no indication whatsoever that he suspected Evans, or any of the other returning parties, of taking more than their allotted rations from the cache. Admittedly you do sense that the thought was pondered by Scott. All of the returning teams had accessed this depot, and to speculate that any one group, let alone any one individual was the culprit, would have been nothing more than formalistic guesswork. Scott was astute enough not to venture into conjectural realms. Despite what Scott may privately have thought (if anything), the subsequent thinkings of Curzon, Kathleen Scott et al, and ongoing theories such as those presented by Chris Turney, the fact remains; that the guilt of any individual, to the charges of stealing food, can only be established by the testimonies of the men they travelled with. No such affirmation exists, rendering the accusation completely and utterly void. Besides, the real problem at the depots was the lack of fuel, not food. The fuel was imperative to the survival chances of all those on the southern journey. It was the only means the men had to provide themselves with essential hot meals. Having food was one thing, but hot food is a basic and crucial requirement, in Antarctic climes. And even more crucially, the fuel was used to thaw ice, and provide the men with drinking water. Despite the insinuative mention of missing fuel, there is no valid arguement to suggest that Evans, or any of the others would have deliberately tampered with the supply. It has long been accepted that the fuel evaporated. The leather washers on the screw topped canisters perished in the extreme cold, and allowed the fuel vapours to escape. Amundsen on the other hand, seemed to be acutely aware of this probability, and had sealed his containers with cork plugs. These were then covered by metal caps, soldered in place, which were cut open as required. The perceived shortfall of rations at the two depots mentioned, would certainly have been a setback to the Polar Party, but would not have been a contributory factor in their deaths. The lack of fuel and the inability to prepare hot meals and provide water, coupled with the extremely low temperatures the group were subject to, on the Ross Ice Shelf, however, would have been. The article dismisses Scott’s statement that they picked up a full ten day’s food, at the South Barrier Depot, suggesting that Scott was so distracted by the shortfall of oil that he didn’t assess the food supply properly. Ten day’s food to traverse the 70 mile expanse between the South and Mid Barrier Depot, was more than ample. Turney points out that Scott, in an entry three days later, noted that they had not as much food as previously thought. This is simply not true, and perhaps the authors mistake stems from a misinterpretation of Scott’s term, “open out” – in relation to food. But just three days later, Scott had realised all was not well. We must open out on food soon. . . We talk of little but food, except after meals. . . We are naturally always discussing possibility of meeting dogs, where and when, etc. It is a critical position . . . 31 miles to depot, 3 days’ fuel at a pinch and 6 days food. Things begin to look a little different; we can open out a little food from tomorrow night. . . Selective transcription of Scott’s journal entry, on February 27th, 1912, as it appears in article by Chris Turney – Link to article. “Monday, February 27*—Desperately cold last night: -33 ° when we got up, with -37 ° minimum. Some suffering from cold feet, but all got good rest. We must open out on food soon. But we have done 7 miles this morning and hope for some 5 this afternoon. Overcast sky and good surface till now, when sun shows again. It is good to be marching the cairns up, but there is still much to be anxious about. We talk of little but food, except after meals. Land disappearing in satisfactory manner. Pray God we have no further set-backs. We are naturally always discussing possibility of meeting dogs,* where and when, &c. It is a critical position. We may find ourselves in safety at next depôt, but there is a horrid element of doubt. Camp R. 41. Temp. -32 °. Still fine clear weather but very cold–absolutely calm to-night. We have got off an excellent march for these days (12.2) and are much earlier than usual in our bags. 31 miles to depôt, 3 days’fuel at a pinch, and 6 days’food. Things begin to look a little better; we can open out a little on food from tomorrow night, I think. Very curious surface—soft recent sastrugi which sink underfoot, and between, a sort of flaky crust with large crystals beneath. Nowhere in this entry is there a suggestion that Scott had realised all was not well. Quite the opposite in fact. Yes, he does pertain to a horrid element of doubt, but this has nothing to do with food. They had been subject to dreadfully low temperatures, and the surface was proving very difficult for man hauling, which slowed their progression. None of the preceding groups had experienced such desperate cold or surfaces at this stage in their return journey. It is also suggested by Turney, that even though there is no mention of a shortage of food at this depot, in Edward Wilson’s diary, it is possible that just such sentiments may have been wrote, but were later removed by his wife, Oriana. Scott, Wilson, Oates and Bowers were 31 miles from the next depot with six day’s food in hand. This would have covered them for an eventuality of travelling as little as 5 miles a day, at a time when Scott states they covered 12.2 miles that day. Contrary to the article’s claim, Scott actually wrote that “things begin to look a little better” and adds that they can open out on food from the following night. The term to ‘open out’, was Scott’s way of saying they could have extra food, and not that it was some restrictive measure, as it seems to have been interpreted. With plenty of food on board, Scott had been cautious not to open out, until the fear of not reaching the next depot on schedule, (because of the surface conditions) had abated. Scott confirmed that he had indeed increased the food allowance the following day, to the benefit of all, and also stated that they would arrive at the depot with a full three day’s food in hand. Hardly the stuff of starving, sabotaged men! So what went wrong from hereon in? Having arrived at the Middle Barrier depot, with a surplus of food , they must surely have felt they were well on course. But as soon as the following day, as they made their tracks towards Mount Hooper depot, 71 miles away, Scott lamented a huge turn in fortunes. Firstly they had realised that the supply of fuel they carried would scarcely carry them to the depot, even with the ‘most rigid economy’. Secondly, Oates ‘disclosed his feet’ to the group. Oates was suffering from terrible frostbite, and from this point onwards, his protracted demise greatly hindered the progression of Scott, Wilson and Bowers. That night the temperature plummeted to -40º C, and the following morning it took the men an hour and a half to put on their foot gear, such was the cold, and the condition of their feet. To add to their ever increasing woes, the surface conditions were atrocious, and they only managed a progression of five and a half mile that day. This was well below the required daily distance they needed to cover, to reach the next supply cache on schedule. Scott’s diary entries continue to bemoan the dreadful pulling conditions, and the shortfall in their distances. The reality is that Scott and his men, and all the prior returning teams did have enough food, to carry them along the gruelling course of their journey. There was never an abundance, and the calorie count of food consumed, would never match that of the number they actually burned in their endeavours. But all the careful planning regarding rationing, had determined that the system of depots and hauling, would sustain them adequately. 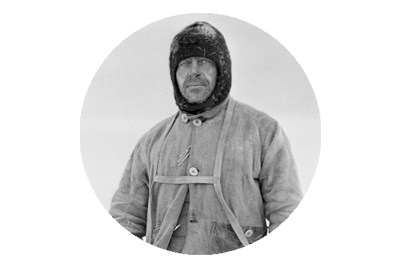 Cherry-Garrard had estimated that the daily distance a four man team must cover, to travel from Hut Point to the South Pole, and back to Hut Point, on full rations was 8.4 geographical miles. The problem with this arrangement was that it required consistent progress between the depots. Failure to meet the necessary daily distances and reach the food dumps on time, was extremely serious. There was little room for error, and no contingency for the inevitable instances of delay, be it weather, surface conditions or the health of an individual. As the polar party imperceptibly advanced along the Great Ice Barrier, circumstances conspired to brutally expose this one major flaw in their plan. Steadily it grew colder; -43º C at midday on March 14th. It was so cold that at times the men were forced to set up camp, to take shelter. Oates condition worsened by the hour – he had not only fallen out of harness, unable to pull, but he also continuously fell behind, and delayed the entire group each morning as he struggled with his foot gear. Daily distances fell alarmingly, as the surface conditions also colluded against them. On March 11th Scott almost foresaw their exact fate. He noted that 6 miles a day, was now the limit of their endurance, with all things considered, and it would not be enough to see them reach One Ton Depot. He estimated that they were 55 miles from the depot and had seven days food in hand. “6 x 7 = 42, leaving us 13 miles short of our distance.” When their bodies were discovered, they lay 11 miles from One Ton. But six days food to cover the 55 miles was more than substantial, had the men been achieving what were considered the average daily distances. Bear in mind they expected to travel between 10 and 15 miles per day. It is patently obvious that though they eventually died as a result of a combination of exposure and starvation, it was as a result of not reaching their supplies on schedule. They died in a helpless limbo, not at a depot that had been plundered by anyone, but between depots; and their failure to reach One Ton can be attributed to the extreme cold, and the subsequent consequences of frostbite, difficult surfaces, perishing leather seals and evaporating fuel. To claim that the actions of Edward Evans, or those of any other individual were responsible for the deaths of the polar party is simply ludicrous, when one considers the magnitude of the severe circumstances faced by them on the Great Ice Barrier; most notably between the Mount Hooper Depot and One Ton Depot. Prior to leaving on the southern journey, Scott had ordered that when the dog teams returned from their role in said venture, they were to be used to replenish the supplies at One Ton Depot, with five weekly units of food, known as XS rations. Along with these supplies, which were deemed crucial to getting the three advance parties home, a depot of dog food was also to be carried to the cache. The order stipulated that if the dog team did not arrive back in time to undertake this task, the supplies were to be man hauled to the depot. It was initially planned that the dogs would turn for home in latitude 81º 15′, but due to the failure of the motor sledges, delays from bad weather, and their own excellent performance, Scott brought the dogs as far as 83º 35′, before they turned for home. As a result they did not reach Hut Point until January 4th, 1912, far beyond their anticipated return of early December. Meanwhile three of the XS rations had been man-hauled from Hut Point, but no dog food was. There was now a shortfall of two XS rations at One Ton, and no cache of dog food existed beyond the Corner Camp depot. Scott’s initial order before departure, also specified that the dog teams were not to be unnecessarily risked, beyond One Ton, after it had been restocked, as they would be used for further exploratory journeyings the following season. The article claims that Scott privately issued a new order to Edward Evans, before the last supporting team parted company with him, on the polar plateau, on January 4th. This order was that the dog team were to continue across the Barrier, until they met up with Scott’s returning party, even if they had to travel as far as the Beardmore Glacier – a huge permutation from the original instructions, that would assume the dog team to be a rescue effort. There is no evidence of this order, in that it was not a written order, but is said to have been verbal. Much can be examined as to why this directive from Scott was not acted upon; such as Evans being on the verge of death upon his return, failure on behalf of those the order was possibly passed on to, or the matter of whether the order was ever issued in the first place. But the abiding point in all of this, is that it simply did not matter, whether Evans passed on the order or not, as any major advancement beyond One Ton was impossible because there was no food in place to sustain the dogs. If there is fault for this, it lies with those that remained behind at Cape Evans, and has absolutely nothing to do with Evans. Atkinson and Dimitri were on their way to One Ton on February 19th, when they stopped off at Hut Point. Shortly afterwards Tom Crean collapsed through the door after completing his epic solo march. 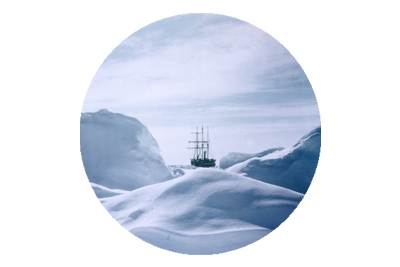 The news he brought of the desperate condition of Edward Evans, 35 miles yonder on the Antarctic ice, then shifted priorities. Once the blizzard Crean had managed to outflank had abated, the two men sledged out and rescued Lashly and the dying Lieutenant, bringing them back to Hut Point. On February 23rd, Crean and Dimitri arrived at Cape Evans with a dog team, having sledged the 15 miles from the hut. Being a doctor, Atkinson had opted to remain behind to tend to Evans, and ordered that Wright or Cherry-Garrard should accompany Dimitri and head for One Ton Depot. As it transpired it was Cherry-Garrard who was selected to make the journey – Wright’s meteorological capabilities were deemed necessary at base, and spared him the prospect of the journey. “1. To take 24 days’ food for the two men, and 21 days’ food for the two dog-teams, together with the food for the Polar Party. 2. To travel to One Ton Depôt as fast as possible and leave the food there. 3. If Scott had not arrived at One Ton Depôt before me I was to judge what to do. 4. That Scott was not in any way dependent on the dogs for his return. It is plainly obvious that the instructions issued by Atkinson, aside from showing no knowledge of any new instruction, were wholly circumstance specific. He could not have ordered Cherry-Garrard to traverse the expanse between One Ton Depot and the Beardmore Glacier, as the means to do so were simply not in place. Extra rations of man food were carried on the sledge, and the dog food cargo would be used to sustain the animals for that actual journey, and perhaps a tentative foray south beyond the cache. That Cherry-Garrard was aware of these limitations and opted not to venture beyond the depot, is entirely understandable. Even if he had decided to proceed to the limitations of the dog food, there was no possibility of him venturing upon the doomed men. I’m eager to see if you find Dr. Sienicki’s “Captain Scott; Icy Deceits…” at all persuasive. I don’t buy the suicide angle but I’ve long held opinions quite similar to his regarding the later actions of Meares, Simpson, Atkinson, E.G.R. Evans and one or two others (excepting in Cherry-Garrard’s case, where my conclusions are a great deal more in accord with what you’ve written here). Not a book I’m familiar with Grigori, but will certainly get my hands on a copy. If you do not believe the suicide theory, then how do you explain the discrepancy between the Scott/ Bowers observations and Sienicki’s retrodiction calculations?